The project is targeting up to 300 beneficiaries in 12 month time. It also entails a rice miller, grain store, dry floor, improved seed rice and tools. I landed in Berlin barely a week ago after I spent complete two months in Sierra Leone, the land that has been branded with and stigmatized by Ebola. So far, preliminary examinations at the Institute of Tropical Medication have proved me Ebola and Malaria free. The trip was scaring though but it taught me too many unforgettable lessons in my life. As an aid volunteer, I saw no good reason to toe the line of those who think their individual lives are better than the 6 million Sierra Leonean population who are currently struggling to survive Ebola and therefore, Sierra Leone should now be “a no-go-zone”. Most importantly, regardless the fact that some of us have been naturalized in Europe, we mustn’t forget the truth that “there is no place like home”. The European passports in our possessions always indicate the places of birth; mine is Matakan/Ngiehun, very poor villages situated in Niawa and Malegohun chiefdoms, Kenema district, eastern Sierra Leone. This was destined by God and shall never be changed by any man. Ebola, Ebola, Ebola and Ebola! This is scaring though but it has become the only interesting topic of discussion in all nooks and cranny of Sierra Leone. The dreadful virus has and still is sweeping the country of its invaluable citizens including medics, youths, women and children. It has reversed the country’s socio-economic development efforts by 360 degree. It has placed the people under a constant state of emergency that has the tendency to derail democracy in any part of the world, as it has seized citizens’ freedom of movement, association and speech. Vehicular traffics between major cities are generally disturbed by many unnecessary road blocks which have been transformed by the securities into extortion scheme. While foreign funds and experts are being poured in to quell the virus, many greedy, unpatriotic and evil-minded citizens are using the situation as a shortcut to riches without labour. They are exploring every little opportunity attached to Ebola and exploit it to the fullest. What we know for sure, however, is the fact that hence Ebola has a beginning and some lucky people are surviving it, it will surely end sooner or later. Then comes the day of reckoning…. if Sierra Leone is a true democracy, survivors would like to know how the entire Ebola epidemic was handled including funds expended during the outbreak. Meanwhile, some of the unforgettable lessons I learned during my visit are the necked manner in which the average Sierra Leonean is exposed to sickness and diseases and their resilient nature to survive. I witnessed the true nakedness and ineptitudes of my home government. I learnt how poorly trained, ill-equipped, less-informed and recklessly exposed the Sierra Leonean nurses are. I’m going to take a look at the Peripheral Health Units (PHUs) at Sondumei, Bandawoh and Gandorhun villages in Niawa Chiefdom, Kenema district where I was born and raised. Since my childhood, I was always fortunate to live with extended families at Kenema, Bo and Freetown where I went to school. As such, I never had a clue of the deplorable heath situation in my real place of origin. Our shipment of drugs and hospital beds arrived in Sierra Leone on the 23rd October 2014 and the clearing and forwarding process went as planned. Our board of directors decided to transport the container to Kenema where we are active. Since we are no professional medics, we dicided to donate all the medical stuffs, disinfectants, 20 beds, 20 mattresses, x-ray extractors, cupboards and wheelchairs to the Kenema government hospital. 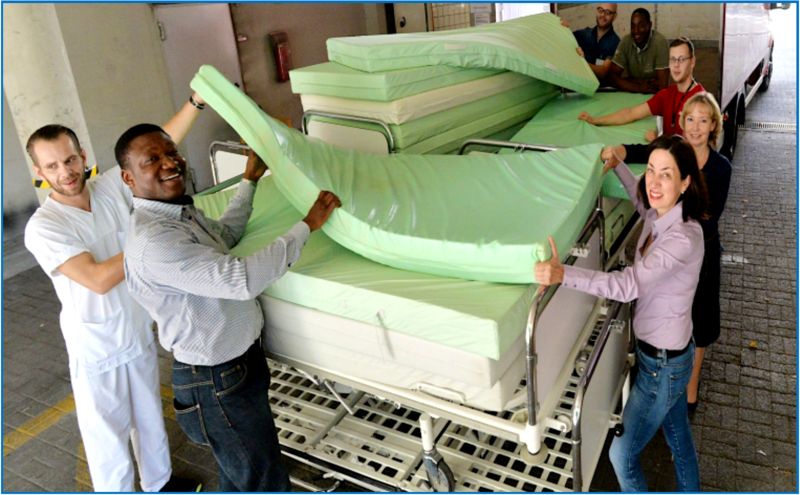 16 beds, 15 mattresses and 4 cupboards were distributed to various Peripheral Health Units (PHUs) in Malegohun and Niawa chiefdoms. Malegohun chiefdom authorities took up the responsibility to transport their own share of the donation, while YAD paid for delivery of the Niawa share. One week before delivery of the donation, I personally visited the PHUs in Sondumei, Bandawoh and Gandorhun in Niawa chiefdom with the initial thought that there might be no space to accommodate our own beds. But to my greatest dismay, our beds were actually going to replace the existing facilities. This was the time I was able to discover that the line of discrimination between the rich and poor in Sierra Leone is more prominent in the health sector than any other segment of our society. The Gandorhun PHU has 5 rooms: 1 is used for patient examination; 1 for admission of lactating mothers and pregnant women; 1 is labour room, 1 is the nurses’ office and 1 is used for dwelling. 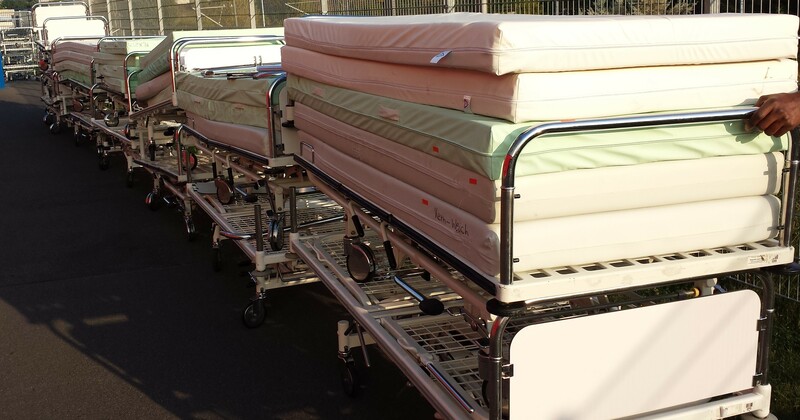 The admission room has only 3 wooden beds with old mattresses. This facility is meant to serve 8 villages with more than 2000 inhabitants. The PHU at Sondumei which supposed to be the administrative headquarter town of Niawa chiefdom, was more terrible than the rest. It’s designated to accommodate patients from all over the chiefdom. It was equipped with 3 old wooden beds, 1 couch and a broken table. No need to describe the situation at Bandawoh, it’s all the same. The facilities were constructed shortly after the war but never equipped by the central government. Even the old wooden beds are said to have been provided by philanthropic organizations operating in the region. The nurses are dwelling right in the facilities since no accommodation has been provided for them. Here, there is no light, no proper water and sanitation facility, no communication network. Patients who are forced to sleep here normally come along with their own pan lamps or candles. Even the most essential drugs are scarce here. In case of emergencies, the nurses usually rush to the hill in the nearby bushes where there is network for cell-phones and call for ambulance, which normally arrive very late. Miraculously, no Ebola case has been so far recorded in the entire chiefdom.